Famed aviatrix Helen Richey exemplifies the involvement of American women in World War II, with all the successes and failures attendant to their participation. When war broke out in Europe in 1939, Richey was already an experienced pilot and holder of several world records. Indeed, in the 1930s she had been one of the nation's most famous female pilots, a young woman with Hollywood looks who set world records for women, and raced with Amelia Earhart. In 1935 Richey had become the first woman to pilot a commercial airline, but was quickly forced out of the cockpit by systematic harassment of male pilots, who considered the new field of commercial aviation their own domain. Job shortages during the Great Depression had discouraged women from working outside the home; however, times were changing. First Lady Eleanor Roosevelt and Secretary of Labor Frances Perkins showed that women could be accepted as decision makers by a male-dominated world. As American industries geared up for war production, employment became more plentiful. This, coupled with the 1940 draft, slowly but surely led to manpower shortages in several areas of the country. Women began to leave their homes and enter the work world into jobs previously hold only by men. Female pilots like Richey longed to serve their country, but the American military was not yet ready for women in uniform. In 1940, Richey broke another barrier, becoming the first woman licensed by the Civil Aeronautics Authority as an aviation instructor. That same year, Jacqueline Cochran, another hotshot female pilot who held world records against men as well as women, repeatedly suggested to General Henry H. "Hap" Arnold, commander of the Army Air Corps, that women pilots could help the expanding air corps. Reluctant to use women, Arnold advised Cochran to gather other female pilots and go to England, where the Royal Air Force was already using women as shuttle pilots in its the Air Transport Auxiliary to fly new aircraft from the factories to air bases. "Hap" Arnold thought that Jackie Cochran and her fellow pilots might gain some experience there while helping our ally fight the Nazis. 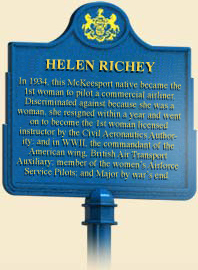 In 1942, Helen Richey was one of the first American women to go to England. When she came home after more than a year's service, Richey joined the new Women's Air force Service Pilots (WASP), a group of female pilots selected to ferry newly built military aircraft from factories to air bases. WASP pilots were originally restricted to flying smaller aircraft, but gradually, as demand for ferrying grew, they piloted big bombers, such as the B-17. Some groups of WASP pilots also flew aircraft that towed targets for antiaircraft practice, sometimes a dangerous assignment. By the time the WASP corps was disbanded in late 1944, more than 1,000 women pilots had performed valuable services for the United States. Women also entered the other branches of the United States military, serving in the Women's Army Corps (WAC), the Navy (WAVES-Women Accepted for Volunteer Emergency Service), the Marine Corps Women's Reserves, and the Coast Guard (SPARS). The United States prohibited women in the military from entering combat, but thousands also served as military as nurses, some of whom were killed while attending to their duties near the front lines. 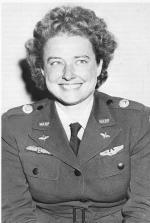 Helen Richey in her WASP uniform, circa 1944. The greatest contribution by women during World War II was at home in the work force. Millions of American men entered the Armed Forces after American entry into the war in December 1941. Faced with critical labor shortages, the War Manpower Commission directed that defense industries "fully utilize … the largest and potentially the finest single source of labor available today–the vast reserve of women power." Women generally received lesser pay than male workers, many of whom resented their presence on the job. Represented by the ubiquitous Rosie the Riveter, working women learned skills and trades previously denied them, freed up men to fight, and kept factories producing at full speed. 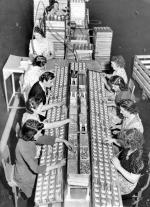 Pennsylvania, with its heavy concentration of defense industries, became a major employer of women. Here, they worked in factories assembling guns, bomb fuses, airplane wings, and other war materiel. They drove trucks and heavy equipment, manned the railroads, and welded steel in shipyards. Close to 6.5 million women went to work during World War II; by 1944, they represented about 36 percent of the entire civilian force. After the end of the war, employers quickly laid them off to make room for the returning veterans. Most accepted the loss of their new jobs and economic independence, but others found the loss of opportunities difficult. Depressed by her inability to find employment as a pilot, Helen Richey committed suicide in 1947. For other women, though, the war provided the impetus to increase their struggle for equal rights. In 1943, Max Lerner, a well-known New York journalist, recognized the changes that were taking place. "[W]hen the classic work on the history of women is written," he penned, "the biggest force for change in their lives will turn out to have been war. Curiously, war produces more dislocations in the lives of women who stay at home than of men who go off to fight." To learn more about Helen Richey's earlier career as a record-breaking aviatrix and about her death, click here. Glenn Kerfoot, Propeller Annie: The Story of Helen Richey, the Real First Lady of the Airlines (Lexington, KY: Kentucky Aviation History Roundtable), 1988. Diane B. Reed, "Wanted: Women to Meet the Wartime Challenge! A Pictorial Essay," Pennsylvania Heritage 21:2 (Spring 1995): 12-19. Marianne Verges, On Silver Wings: The Women Air Force Service Pilots of World War II (New York: Ballantine Books), 1991.